MARTIN O’NEILL HAS confirmed he is to stay on as Ireland manager following recent speculation which linked him with the previously vacant Stoke City job. Both the 65-year-old and the FAI had until this evening remained silent on his future in spite of widespread recent reports that he was bound for the bet365 Stadium – suggestions fueled by the fact that O’Neill had not yet signed a new contract with Ireland despite reaching a verbal agreement as far back as October. 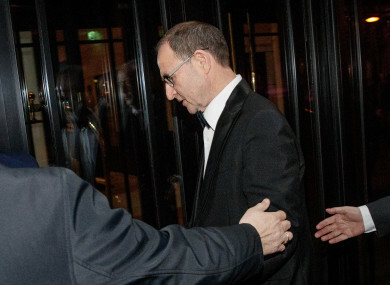 As laid plain by the FAI prior to the event, O’Neill refused to speak to the media or clarify his position while attending a Soccer Writers’ Association of Ireland (SWAI) awards banquet on Friday. In a video released by the Association this evening, however, the former Leicester and Celtic manager confirmed that his contract situation with the FAI is ‘resolved’. He still hasn’t formally signed an extension, however: O’Neill suggested that he is awaiting lawyers ‘to look over some sort of detail’ before officially putting pen to paper. It was reported on Sunday that O’Neill had turned down the Stoke managerial position, with the Premier League club eventually appointing his former Hoops midfielder Paul Lambert having also missed out on chief target Quique Sanchez Flores of Espanyol. O’Neill, who led Ireland to the last 16 at Euro 2016, described the prospect of seeing the draw for the Euro 2020 qualifiers – due to take place in Dublin in December – as ‘exciting’. The Kilrea man indicated he would be introducing to his squads for Ireland’s upcoming friendlies ‘some younger players who are hungry’, beginning with the trip to Turkey in March. Email “Martin O'Neill says FAI contract situation 'resolved' as he begins preparation for Euro qualifying”. Feedback on “Martin O'Neill says FAI contract situation 'resolved' as he begins preparation for Euro qualifying”.